The API (Automated Processes Inc.) 5500 is a 1U rackmountable device that contains two API 550-type equalizer circuits – so it can be used to process a stereo pair or two separate mono signals. Highly regarded in Pro Audio circles, this model can be used for tracking, mixing, or mastering. 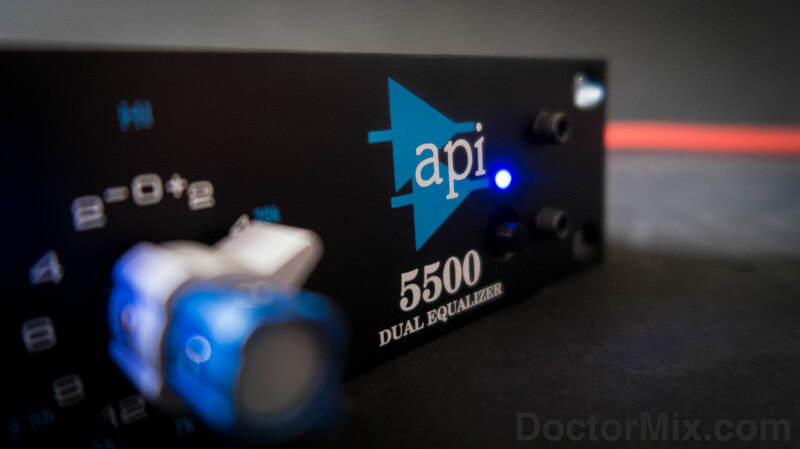 The API 5500 is a development of the original API 550 equalizer that was designed back in 1967 as a console equalizer with an unbalanced input by API’s founder, Saul Walker. The current API 5500, launched in 2006, has balanced inputs, a ‘straight-wire’ bypass, and an integrated power supply with noiseless muting. Shortly after the power is first applied (or immediately after it is lost), a special circuit enables the Bypass mode so that power thumps are never heard – nice feature! Technically, the specifications are extremely high: the 5500’s input XLR is connected to an active balanced circuit and the unit’s output XLR is driven from a transformer coupled output that can drive any load from 600 ohms or more to full output capability. As is explained in the manual, “The 5500 contains no integrated circuits in its signal path. The gain comes from two hand-built 2520 Operational Amplifiers in each channel. The balanced input is handled by a 2510 Discrete Operational Amplifier, which is similar to the 2520, but without the high-current output stage. A key component of the API sound, the 2520 coupled with the API 2503 output transformer, is capable of delivering +30dBm before clipping. With this much headroom, it is unlikely that the 5500 can be driven to distortion.” – very impressive! The front-panel knobs for gain and frequency are dual-concentric types, with the outer ring, closest to the panel, allowing boost or cut of up to 12 dB in five steps above or below unity gain, and the inner, upper, knob allowing the user to switch between seven EQ filter centre frequencies. The legends for the gain steps are written in white to distinguish them from the EQ centre frequencies, which are written in blue. The four EQ filter bands cover ‘Lo’ centre frequencies from 40 to 400 Hz, ‘Lo-Mid’ from 75 Hz to 1 kHz, ‘Hi-Mid’ from 800 to12.5 kHz and ‘Hi’ from 2.5 to 20 kHz. You may be wondering where the filter bandwidth or ‘Q’ controls are located. Well, there aren’t any! The API’s equalizers use what they call ‘Proportional Q’ circuitry. The way this works is that the bandwidth of each EQ filter is very broad when low amounts of boost or cut are used, but becomes progressively narrower as larger amounts are used. In practice, large cuts or boosts are typically used to remove unwanted sounds at particular frequencies, or to emphasize particular frequencies to exaggerate the ‘attack’ of an instrument, for example. The ‘Hi’ and ‘Lo’ bands can be switched using nearby buttons so that they have a so-called ‘shelving’ response – as indicated by the legends above each of these buttons, which show the shapes of the frequency responses (that are said to look like shelves). Pressing the Bypass button, located more or less in the centre of the front panel, engages a true ‘straight-wire’ bypass such that the input is fed directly to the output with NO electronics in the signal path – just pieces of wire connecting the inputs straight to the outputs! It can be useful to switch an EQ in and out of circuit while you are setting this up so you can hear the effect of adding the EQ compared with having no EQ, so each EQ channel has an IN button for this purpose. But beware! This function differs from BYPASS in that the electronics and output transformer are still in the signal path when the EQ IN button is deselected, so some changes to the input signal may still be audible. Finally, the power on/off button, located at the far right of the front panel, has a unique transient bypass capability. As the manual explains, “When powered down, the unit is automatically forced into bypass, regardless of the BYPASS selection. Upon power-up there is a delay, which allows all the electronics to stabilize for approximately two seconds by enforcing bypass mode. Also, if power is removed or lost for any reason, the bypass mode is immediately invoked in order to maintain signal throughput without any interruption.” – another well-thought-out design feature! To sum it all up, here at Doctor Mix we’r are definitely appreciating the excellent build quality and the ‘top notch’ design features, not forgetting the smoothness of the sound coupled with the ease-of-operation. Groove on API! Download the API 5500 User Manual as a PDF file here.